(Above: An ethnic Albanian woman who has spent two months hiding in the woods, sits in the ruins of a destroyed house that she now lives in. 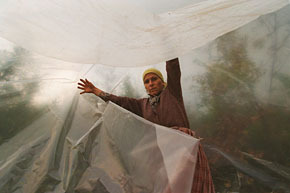 Many refugees of the conflict, like herself and the woman below, eek out an existence in the woods camping with little but a plastic sheet to keep out the rain and snow. Above right: Refugee camps isolated and dispersed in the mountains of Kosovo. Some 10,000 Albanians live under tents in the forest for the last 3 months. Their houses and villages have been destroyed by the Yugoslav army and special forces.